I absolutely love roses on wedding cakes. I’m not sure if it’s because I love roses or because there are so many colors and varieties and they all look stunning on a wedding cake. But whatever the reason, if there is a cake with roses I’m going to swoon. And that’s exactly what happened when I saw this beauty over on the “Ever After Blog” on Disney’s Fairy Tale Weddings and Honeymoons website. I swooned. I really, truly love this cake. For starters the icing is that stark white icing that lends itself to so many decorating options. I am a huge fan of cakes that feature a smooth and bright white palette. And then we have the roses. 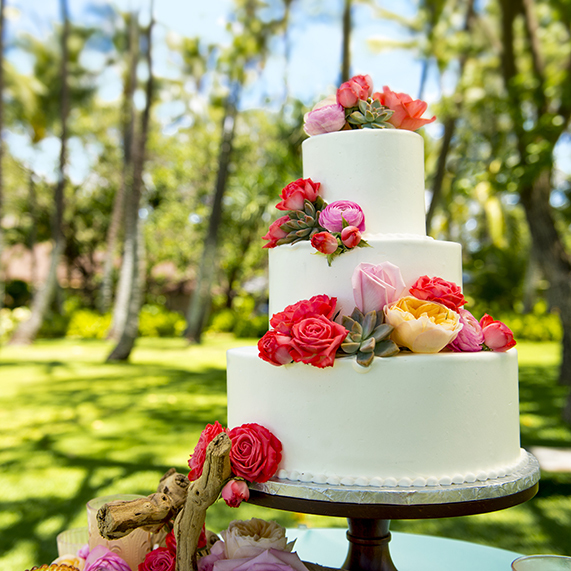 This cake was featured at a wedding in Hawaii at Aulain, A Disney Resort & Spa, so they are Hawaiian roses. The colors are so bright and cheerful and they make the icing pop! To add a little bit of green to the cake the bride and groom chose to use succulents as an accent and they’re a perfect combination with the bright colored roses. Even if you aren’t getting married in paradise, roses and succulents are a great color combination. I am imagining a cake with black magic roses (deep red) and succulents at a fall wedding. Or bright pink roses and succulents at your spring wedding. It’s a winning combination no matter what time of year.